Going to Cleveland Zoo can be a fun experience for the whole day. The good news is that you can even take your kids with you and the experience can last from a few hours to the whole day. Going to the zoo can thus represent a learning experience which is one of the main reasons so many kids love it. To get into the zoo you will need to purchase tickets for adults and for kids over the age of 2. Adults will have to pay $14.25 for a ticket. For the rest of the people, the tickets will get cheaper. For example, seniors over 65 will pay $12.25 for a ticket. Children between 2 and 11 will pay $10.25 for a ticket. For those under the age of 2, the access is free. There are a few ways in which you can save on tickets. The simplest way to save is simply by purchasing the tickets online through the official website which will save you $1 for each ticket. If you want to spend multiple days at the zoo every year you can also select from a dedicated membership. This can prove to be a great solution both for individuals and for groups. Thus, seniors can have a full years` membership for $54 while adults will pay $60 for the membership. There are also family packages which range from $94 to $154 per year and can represent a great solution if you want to save money and visit the zoo with your family as many times as you want in a year. As a sign of respect for the military and their families, the zoo offers a 50% discount for all family members of military men and women for a number of up to 6 people. You can also choose an online coupon which can be purchased online. If you are traveling with your school, you can also benefit from reduced rates. Thus, groups over 20 will have preferential prices as follows: adults $12, ages 12-17 $12, ages 2-11 $8. The zoo is open from Monday to Friday from 10 AM to 5 PM. On the weekends it is open from 10 AM to 6 PM. Getting to the zoo is not complicated but you may encounter some delays due to busy days such as on Saturday, Sunday and Monday. You can get to the zoo by bus or by car. If you are taking the RTA bus, you can call (216) 621-9500 for a full schedule. If you decide to drive to the zoo, you can exit at Fulton Road from the I-71. Next, you will need to keep right and follow the road and the Fulton Parkway South until you reach Wildlife Way. Here, you will turn left to the entrance of the zoo and the parking. Parking at the zoo is free of charge. If you plan to spend the whole day at the zoo you are probably worried about food. But the good news is that there are a few options which might be useful to a wide range of needs. Thus, at the entrance, you`ll be able to purchase sweets and drinks. If you want to cool down in the hot summer sun you`ll be able to get a fresh lemonade in the Welcome Plaza. There is also a food court which offers a range of options which include pizza at Pizza Hut, snacks and drinks at Dave`s Cosmic Subs, beers at the African crossing, coffee drinks and snacks at the Carousel Café, drinks and snacks at the African Savanna, snacks and drinks at the Australian Adventure, chips and hotdogs at the Wilderness Trek etc. You will also find a dedicated zoo shop which comes with various souvenirs for you to choose from. You`ll be able to choose between various books, toys or other souvenirs. Or you can also purchase an official map. In terms of services for visitors, you will be able to choose between a stroller, a double stroller, an electric wheelchair and a push wheelchair. With prices from $8 to 25$, you will be able to rent them and use them across the zoo as it is designed for wheelchair access in all areas. A tram service is also available for comfortable transport across the zoo. You will find various restrooms across the zoo. Nursing mothers will also have a dedicated private area in the Welcome Plaza. If you want to take advantage of the educational programs offered by the zoo there are a few options to choose from. The Inside Tracks will provide you with a detailed tour of 90 minutes which will take you behind the scenes of the zoo. For $50 you can experience animal care, conservation and behavior models with a guided tour. You must note that the admission fee is paid additionally to the entry ticket. Teachers will also have the opportunity to go through a dedicated tour which can be a great solution to reignite the passion for animals or even hold a class with a great fun and motivating environment. The main attraction of the zoo comes with its animals. You will be able to see and learn about different animals of all size. The good news is that this can be a great educational experience which will allow you and the kids to improve your knowledge of the animal world. One of the main attractions of any zoo comes with bears which kids love to watch. The good news is that Cleveland Zoo has both the Grizzly and the American Black bears to see. The American Black comes with an all-black color which even changes to shades of blue. The animal`s weight can range from 125 to 500 pounds, making it one of the largest animals at the zoo. Smaller animals can also be seen at the zoo. The Hairy Armadillo is one of the top attractions with kids. These small creatures are powerful diggers and they live in burrows. An interesting fact about armadillos is that they will usually run when they see people. If they can`t run fast enough, they will usually try to protect themselves by pulling their legs into their armor so that the armor will touch the ground. You`ll also be able to see some interesting snakes such as the Boa. The Emerald Green Boa comes with bright colors which make it easy to spot. It can usually grow to a length of 8 feet and can easily move towards its prey. If you are looking to see real predators, nothing can come close to a Cheetah. 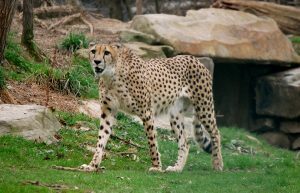 These animals seen at the zoo come with a very muscular physique and a flexible body which allows them to be real predators even at very high speeds. The short fur of the animals also makes them look distinctive as they can be considered among the top predators of the wildlife. If you are a fan of birds you can find the Crested Cockatoo at the zoo. These animals are usually close together as they live in flocks. The interesting defense characteristic when they feel danger is that they usually have a few individuals who remain at the top of the trees for good visibility. When they feel a danger they begin making loud sounds and fly away making the whole flock fly with them. You will also be able to see crocodiles at the zoo. These animals are usually timid and they prefer to move at night time. Even as they move slowly, they can be very dangerous. But when they reach adulthood they prefer a solitary life. If you are a fan of larger animals, you will be able to see elephants at the Cleveland Zoo. These huge animals have an impressive brute force which is powered by over 40.000 muscles. Males can even grow to a height of 11 feet while weighing up to 12.000 pounds. Donkeys are also present at the zoo. These smaller animals can come with a weight of up to 500 pounds. They are known for their distinctive short fur and the cross pattern on their backs. Cleveland Zoo covers an area of over 21.300 acres across 18 reservations. The Metro Parks come with more than 300 miles of trails which make them perfect for all types of events and for visiting. The extended area of the Metro Parks comes with various activity possibilities which include hiking, paddleboarding or kayaking. The good news is that the large area provides not only a fantastic zone for outdoor activities but also for conservation efforts. With wetlands streams and forests, the area represents a true environment which is a solid base for education, science, environmental protection and environmental restoration. You will find a wide range of animals at the zoo and the good news is that they cover a few main families from birds to reptiles. You can take the opportunity to familiarize yourself with the animals but you can also spend time with your kids while they learn about the different characteristic of each animal. With free parking and plenty of places to eat and drink, the zoo can represent a great alternative if you plan to spend the whole day outside. The good news is that the zoo comes with easy access for wheelchairs as well. Even more, you can rent electric or push wheelchairs from the main entrance which will allow many people to fully enjoy the zoo. If you want to save on tickets you can do so if you come with large groups or if you come with people over 65 or children. But if you really enjoy spending time at the zoo you can take the opportunity to get a yearly pass which will save you even more money and it will allow you the opportunity to spend as much time as you want to watch the animals. There are plenty of good activities to choose from at the zoo. This is one of the main attractions for those who want to see how things happen behind the doors. The good news is that this will lead to more opportunities when you want to see how the animals are fed and taken care of. If you plan to learn more about the animal and the environment you can take the opportunity to do so with the extended area of the Metro Parks. This unique area is a fantastic resource for learning. You can come here for science purposes but you can also find this to be a good opportunity to study conservation and environmental care. If you have an adventurous spirit, you can go beyond what the learning experience and enjoy hiking, running and even paddleboarding in the area. This makes the whole area one which can offer an interesting activity for everybody. With easy access from the I-71, you will be one of the lucky people to enjoy a pleasant experience for the whole day. The zoo also comes with all the extra amenities you would need. These include dedicated private areas for nursing mothers and even a dedicated gift shop. You can find many animals and other souvenirs at the shop which will remind you of the animals you saw with your family during the visit. The good news is that you can choose something for everybody and you may even get some ideas from the official online shop you can visit from home.